During the summer, being able to spend time resting on your patio becomes a necessity. Nothing measures up to the relaxation gained sitting under the sun, but what happens when the weather gets too much to bear? Of course it also is prone to raining during our British summertime, so why not take more control of the weather with a high quality retractable awning from leading manufacturers Markilux and Weinor. 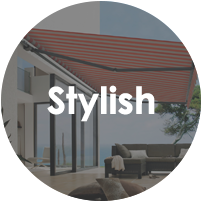 To fully enjoy the very changeable UK weather it is essential to specify a patio awning capable of dealing not only with rainfall but also the seemingly ever increasing winds we experience. 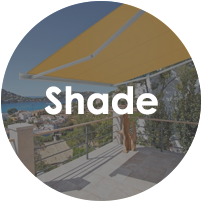 A cheap, off the shelf awning created purely for a bit of shade from the sun will certainly not last in our UK weather all year round. 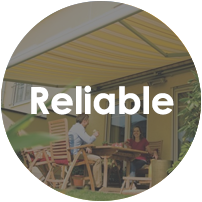 Whether it be the scorching sun or a sudden downpour of rain, The Garage Door Centre are working alongside sister company Samson Awnings to ensure we have it all covered with a model for every requirement and all made to order within 3-4 weeks. 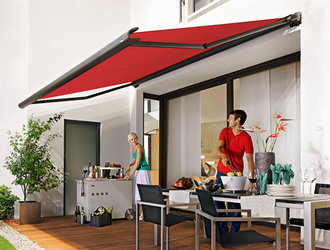 The Markilux 990 is a sleek, compact full cassette, retractable awning aimed for use on patios, decked areas and in gardens. Its highly engineered design allows this awning to be perfect for most homes and made to order up to 5000mm wide with a maximum projection of 3000mm. This patio awning is highly popular within the awning market due to its visually pleasing subtle design. Despite being recommended for patios, decked areas and gardens, the Markilux 990 would not look out of place in office blocks, restaurants and pub gardens and many other environments. It is one of the most discreet cassette awnings on the market and available in some beautiful finishes to compliment the exterior to most buildings. Available in a range of different cassette colours, awning fabrics, material colours and with the option for remote control operation, this awning can be fully personalised to meet your needs. The Markilux 5010 boasts a perfectly uniformed appearance and offers highly competitive levels of sun protection, strength, diversity and style. It is the bigger brother of the 990 with sizes available up to a massive 14 metres wide and a projection of 4 metres. 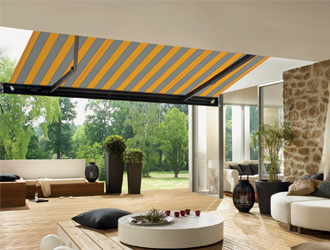 Known as the 'designer' patio awning, the Markilux 5010 has a range of different cassette designs including the use of chrome strips to add a unique style. It provides a fantastic source of sun protection for both domestic and commercial applications. Electric operation is available on request with a selection of awning accessories to make your awning experience that much easier and enjoyable. This awning is available with a drop down automatic valance, optional lights and heaters and, many different sun, wind and rain control systems. This is one of very few awnings that can achieve a large 4000mm projection combined with a 7000mm width in one piece. The Markilux 6000 is a top quality full cassette awning. The Markilux 6000 has an appealing design. To create a personally individual design you can mix and match the colour of the cassette with that of the end cap trim and the end cap insert. A very special new feature from the Markilux team includes a newfolding element in the arm hinge, aptly named the "bionic cord". The new technology ensures the friction-free, noiseless bending of the folding arm. The front profile has integrated gutter and hidden water drainage spouts. The maximum dimensions of a single unit are 700 cm of width, with a drop of up to 400 cm. If a customer requests a wider system, it is possible to couple several units in order to achieve the over-all width required. The Markilux 6000 is available from The Garage Door Centre at direct prices and can also be purchased from our sister company Samson Patio Awnings along with a whole range of other sun, wind and rain protection products. The Weinor Cassita II is a fully equipped full cassette awning intended for use on small to medium garden patio areas. 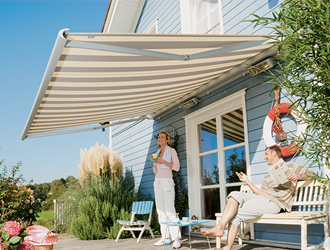 Its small cassette casing is often deceiving as this awning can reach maximum projections of up to 3000mm. The Weinor Cassita II offers high levels of protection against sun, wind and rain. 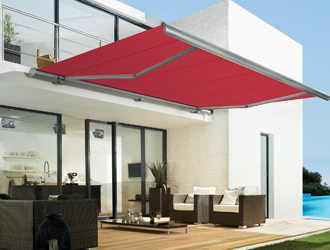 When this stylish patio awning is retracted the folding arms, awning covers and all other components are fully protected by the designer cassette which ensures a longer life and requires minimal maintenance. This entirely flat awning is suitable for wall fixing for maximum protection. With the cassette measuring in at 22cm wide x 12cm high, it can be hidden away well when not in use. There are various features that making this a stylish awning, including a slim cassette design and an optional LED light bar. Minimalistic frame with high utility was the development order for the designers of the Markilux Pergola. 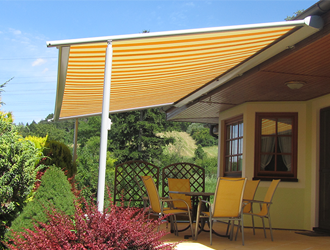 This retractable awning system resting on slender posts with unobtrusive lateral support guide tracks, permits stylish shading even of large areas with a maximum projection of 6 metres and single cover width up to 7 metres. The retractable patio and terrace cover system, allows for much larger areas to be covered with a higher wind rating than an awning. This is also a perfect solution if you want to protect from the rain by using a good slope of pitch, a zip channel system and the Pergola 210 corner leg pitch adjuster. 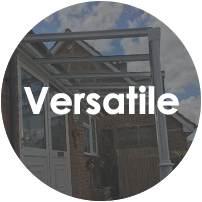 The Pergola system is only available as an electric operated system due to the high tension involved in the fabric retraction and because generally these are much larger units than standard patio awnings so would take a long time to operate manually. With sizes up to 12m wide and 6m projection with a new zip system available to ensure the tightest of fits for the fabric down the side channels. The Weinor Terrazza is a patio roof structure built with patio protection in mind. 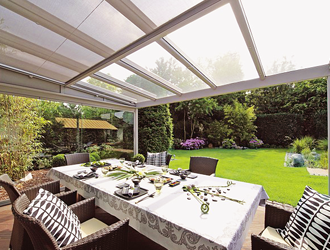 Covered by protective layers of glass to optimise the full use of daylight, the Terrazza can extend your patio use no matter what the weather. During the summer months, the Weinor Terrazza can help your patio become an extension of your living, dining and entertaining space regardless of the weather. Anything from parties, barbecues to reading outside and simply enjoying what nature has to offer – the Terrazza can allow you to enjoy all of this with its solid & waterproof glass roof structure. During the autumn and winter months the Terrazza can provide a comfortable outdoor area to sit in underneath the protection of a glass roof. Side screens, sliding glass doors, zip screen blinds and many other protective products can be added to the sides and the front of this modular system so you can create your own outdoor oasis. 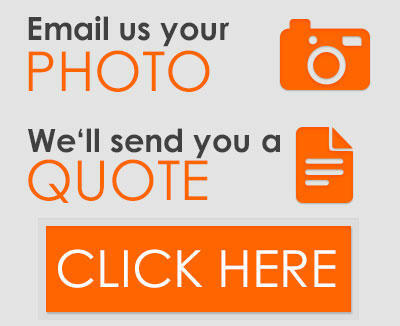 Make the most of your garden and patio all year round with any of our fixed roof systems. Transform the Terrazza into a full blown Glasoase with the addition of various choices of sliding or folding glass door systems to some or all of the sides. Create the most wonderful outdoor room to enjoy the full beauty of the outdoors whilst protected from the elements with far more control of the temperature and light ingress than any conservatory can give.